Shadowbox Live’s “metaperformers” are Monty Python fans. That’s obvious throughout their production of Spamalot, the musical inspired by the 1975 film Monty Python and the Holy Grail. You can see the love in the working-class British accents and the squeaky voices of the suspiciously mannish women. You can see it in the perfect timing with which the “Knights Who Say Ni” squawk out their signature word. You can see it in director Stev Guyer’s patient willingness to allow each scene to expand to its maximum level of hilarity. For the unaware, Monty Python was a BBC-bred comedy troupe that combined brainy humor with rampant silliness and an anarchic disregard for societal norms. Spamalot, with book and lyrics by Python alum Eric Idle, simultaneously spoofs the King Arthur legend and Broadway-style musicals. The latter comes out in numbers such as The Song That Goes Like This, a dead ringer for the kind of show-stopping tune that’s become an Andrew Lloyd Webber hallmark. At Shadowbox, Idle’s Tony-winning musical allows numerous performers to put their acting and singing strengths to optimal use. After spoofing operatic divas in previous Shadowbox theme shows, Stephanie Shull brings the same kind of energy to the Lady of the Lake, a role that also makes the most of her powerhouse voice. Michelle Daniels narrates Arthur’s adventures as the Historian, while Billy DiPetro supplies comical menace as the disapproving father of a son who fancies himself a maiden in distress. Also along for the virtual ride are JT Walker III as Galahad, David Whitehouse as Lancelot, Jim Andes as Bedevere and Robbie Nance as Robin, as well as a host of others playing the threatening soldiers, trash-talking “Frenchies,” lascivious ladies and sundry monsters the knights encounter during their quest. Katy Psenicka’s alternately medieval-rough and Broadway-glitzy choreography adds to the fun, as does Matthew Hahn’s musical direction and a band that’s often dominated by Kevin Patrick Sweeny’s keyboard work. Due to acoustics and accents, a few lyrics and bits of dialogue may be difficult to catch. But that probably won’t be a problem for true Python fans, who know the show by heart anyway. Speaking of which, if you are such a fan, don’t give in to the temptation to call out punch lines in advance, as at least one audience member did on opening night. Otherwise, an unpleasant French person may unplug his nose in your general direction. 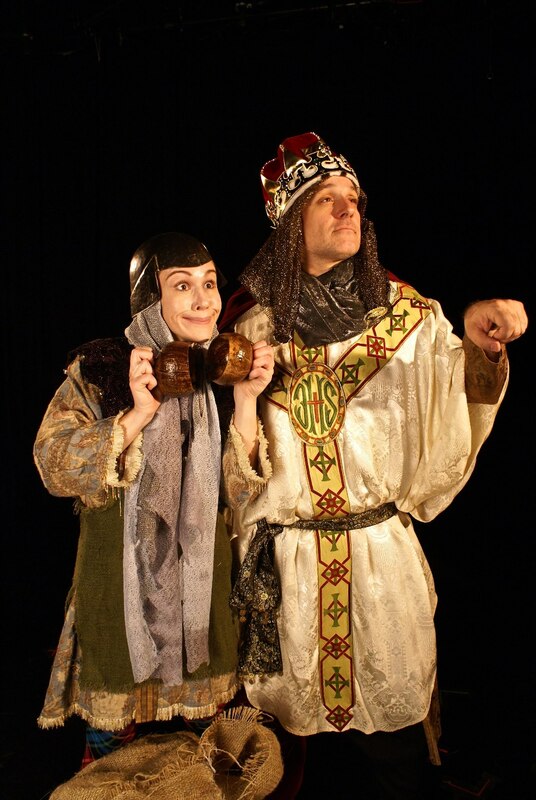 Spamalot will be presented at 2 and 7 p.m. Sundays through Nov. 17 at Shadowbox Live, 503 S. Front St. Running time: 2 hours, 20 minutes (including intermission). Tickets are $30, $20 for students and seniors. 614-416-7625 or shadowboxlive.org. This guy writes like Perric except without the necessary knowledge, wit and self-effacement.